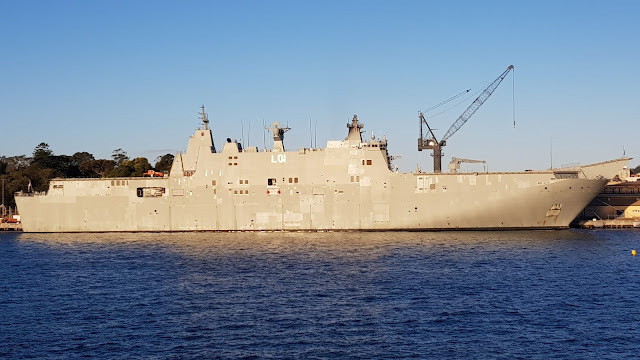 The HMAS Adelaide (L01) is a Canberra class landing helicopter dock ship of the Royal Australian Navy. It was launched in 2012 and is seen here at the Garden Island dockyard, the home port of the naval fleet based on the east coast of Australia. It is named for the city of Adelaide, the capital city of South Australia. Garden Island is a marine engineering and refit centre for the Royal Australian Navy and Thales Australia with the docks extending along Woolloomooloo Bay from Potts Point to Woolloomooloo. This view across Woolloomooloo Bay is from Mrs Macquaries Point in The Domain at sunset. Great reflection image. Have a lovely weekend. I almost always get a comment about the name of that suburb, when I feature a photo from there.